Club Penguin Cheats by Mimo777 Club Penguin Cheats by Mimo777: This Weeks Herbert's Revenge Sneak Peek! Herbert's Revenge, Club Penguin's newest Elite Penguin Force Nintendo DS game is almost here! Let's take a look at the newest Sneak Peek! Two pictures this week. The first is from last week showing a little more. What do you think the second pic is? Remember There will be sneak peeks every week Until herbert's Revenge comes out. Come on! Let's have some new Theories! Give me some WIERD and WARPED theories! WHAT SERVER R U ON???!!! A PUDDING PLANT! SMELLY ZEBRAS EAT THEM. AND THEY MAKE PUDDING! TADA IM A GENIUS! Woot! Still can't wait! Remember the countdown a few days ago I said I had on my computer? Forty four days left! Unless it comes out early, which would be cool! But for now forty four days to go! Ok heres my warped theory Mimo. Maybe Herbert will invest in chicken legs and gum ballz. Then when he gets enough to conqure he will unleash his chicken leg army and they will have the ability to shoot gum ballz everywhere! He will then make a giant heater and while being warm it will also cook all the chicken legs! It's a win win for him! We must stop him! it could be his inventions or or the inventions gary made lol.and the cave is where the forest is. I think the second one is some sort of map! Plus, I check your site for posts 24/7! Weird huh? Ok how about it a huge 40 foot penguin with three heads lands on Herbert and he dies. Then the mutant penguin is the new villian of CP. I think the first pic is a picture of his cave that he was hiding out in and trapped the agents in. I think hes making a decoy, but he didnt get to finish it yet, and he left in a getaway car type thing OR he left on a machine to destroy CP. I think the second pic is him trying to find the Director. maybe hes planning to take over clubpenguin and using a mindcontrol hat on all penguins! ok, i have a weird theory... I think Herberts hideout used to be the cave, so he must have found it wayy before us. Maybe he was renovating it to make that waterfall in the cave and the other room with all the gold. (he used dynomite to make a hole at the very end of the island to use the water from the ocean which could have caused the rockslide)He stopped his construction because he knew that we would get curious. So as quickly has he could, he made a hideout under the cave and an elevator that leads up to the cave. (as shown in the picture)He found out that we were digging out the rockslide and that we found the cave. Now he is mad...Herberts Revenge.....DUN DUN DUNN!!!!!!!! It looks like herberts trying to find out more PSA look at the map in the top left then look at the middle of the board there some kind of connections tree! maybe herberts trying to kidnap some members of the PSA. I bet the SA part of it is really PSA and the camera is the thing from the mission Spy and Seek. Then theres the picture of what looks like the sun and the Earth. Then maybe the red cross out thing is a magnet. MAYBE the mine shaft thing will take him down to the center of the Earth and then the red cross thing will harness Earths magnetic energy and pull the sun closer to the Earth to make Club Penguin Melt and make more heat for him. I think Herbert is trying to make CP into a dictatorship. The statue of Herbert would be like a shrine type thing and it is wearing that mask, which is usually a sign for a dictator. In the other sneak peek of the desk, theres a chart with four squares with one on top. I think Herbert is seeing what he has to do to make it to the top so he can dictate Club Penguin. I think once he has control, he will melt Club Penguin and make it warm. I think on the 2nd pic he is searching for the PSA HQ. I think the second pic is him trying to find the Director. These are all great ideas, because he could be trying to find the director and stop the PSA at the source! He could be using the award as his own for "Finishing the job" trophy, the decoy to get the director ungarded, and the 'cut off' binoculars in the 2nd pic to look for him. I know its a long explanation, but its SO SIMPLE! wait no ones noticed but in the secound picture theres the thing you use to spy on herbet ya know operation hide and seek well he night improve them or use them against us.sooo maybe! I think that Herbert wants to find where the PSA headquarters are. Um. I had this weird felling that this belongs to Mission 11. It looks like the inside of Herbert's cave. Cool looking forward to that!! LOL! did you get that from the spongebob movie? Well, you can't just ask him to be a mod. You have to answer people's questions and stuff! It takes a while, but it's worth the wait! You have to earn it. And when you become a Mimo Mod, you get to meet up with Mimo777 and become his buddy! Were it says sa,it might really say psa. Mimo, I just thought of something. What if we have to buy the new Ds game, and unlock Mission 11? That would be cool but not everyone could buy it so. Nevermind.But think. Mission 10: Herbert dropped seed packet. Gary picked it up. Herbert was planning an Earth day party. While we are partying at the party, Herbert is drilling in the Underground caves in the mine! I think I could be right. I have a weird and pointless theory... wat if herbert is going to use puffles to start fires for himself! O.o!! this has nothing to do with the game but in the last mission herbert left a pack of seeds. it might be about earth day and the mission thats going to come out. In the First to the right theres a tree From SARAAPRIL'S sneak peek and in the second pic theres a note that says "PSA?" Theres a clue he has been spying on us about our angency and the earth day. i have a theory mimo! Did you see all the newspapers! and planning to come in on a event day, and sneak into the lab! or when cp has a special item, he might steal it! WHAT SERVER R U ON???!!!. Please don't use caps. You're hurting our ears! Mimo777 said it's coming very soon so can you wait? It's easy...easyish. Anyway all you gotta do is answer questions or help someone out. Once Mimo updates the mod chart you might be on there. hi nimo, I know 2 guys in your class who r bros.
Maybe the second picture is all his homework. Herbert must be studying, you know trying to get a job, a family, a nice house....... Maybe. Herbert is planning to do something involving penguins.... what a crazy idea huh? and I asume that the bit of the note we can't see has a P.
Great theory! The 'SA' could be PSA.Also on the SA bit it has a question mark underneath.Hmmmm I wonder what Herberts up to? Cool!So approx it is about 11 weeks or less depending on the month it comes out.Thx for posting how long it is until it comes out. Awesome!I check his site everyday or maybe every 2 hours if I'm not going anywhere.1 for the blogs and 2for the comments.The second 1 could be a map.Good eye! Awesome theory! The decoy also stumps me.Nearly everyone knows or heard about him.hmmmmm...? 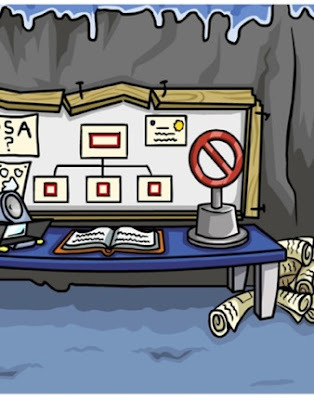 I think the tracks on the first picture is the pathway to the secret epf room.Remember a little while ago CP posted that black and white pic and it had mirrors, i reckon thats it! I have an idea! 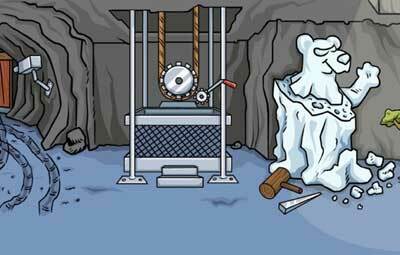 remeber how the yeti penguin was in the news paper!that was herbert and now he wants the puffles to help him knock down the lodge! Just wanted to tell you that I got a letter from Club Penguin. I asked them why we didn't have our normal parties like easter and st.patrick's and they said that lots of people are suggesting new ideas for parties that maybe there will be changes in the future. They know that some players are unhappy about it but they are confident that these new parties will be a hit. I BET ITS GONNNA COME OUT ON EARTH DAY! See the three boxes, and how they link to one? well 1 box is for Rookie, another is for the Jetpack dude/Agent, and the other is for yourself! will have to give something up! BUT WE WON'T LET THAT HAPPEN! IDEA ALERT! IDEA ALERT! The mission gonna come out on earth day and herbert help out but then he picks up a jackhammer and ruins our work and the whole island and he sends us to rockhopper island we have to get off and rebuild the island and herbert is trapped in a box forever until the next mission. What do you think? hes eating the paper to get fatter and fatter so he gets warm from getting fat and then hes going to roll over ALL of clubpenguin then rockhopper sees the fat white fur ball (herbet) and fires his cannon at him. A PUDDING PLANT! SMELLY ZEBRAS EAT THEM. AND THEY ALSO MAKE PUDDING! TADA I'M A GENIUS! I just got banned for saying estupido on a spanish server ( it means stupid in spanish), but I got on my other account and typed stupid on engish and, nothing! i think herbert is trying to melt clubpenguin he will use the seeds to make it warm like a forest!!!! i think if HE had the seeds MAYBE just MAYBE he could make the puffles distrat us and STEAL THE GOLDEN PUFFLE!!!!! TADA I (MIGHT) BE A GENUIS!!! Me please can i join? cooool how was florida? did you do anything cool? yeh thats just about right but i need to add in one thing herbet might be checking every buliding wilst we enjoy the earth day party so realy its so simple herbet planed the earth day party to put us off looking. Answer a question in a comment that someone has put in a comment. Put your name at the bottom of the comment answering the question that another person has done and after your name write (CPG MOD). Then just be good and repeat the steps, then you will be added to the list of the mods. Do not put (CPG MOD) after your name if you are not answering a question. What else are seeds for? JK! Anyway maybe! Ooooooh! Maybe it Herbert plans on growing puffel O's and he will capture all the black puffles and force them to give him heat! Mod Shake Up? WHEN!?! YES! ADD ME SOON MIMO! Mimo, if you want to post this you can. Its sorta my theory mixed with some other peoples. Okay? OKAY! - Olivia48yes (CPG MOD?) trainee! I forgot... Is this for the new game or the new mission? LoL Smelly Zebras. That's as funny as the name bob. i know! Mimo777 is gonna be there and blow up herbert! I don't think so, Herbert does not treat Klutzy that kindly. Yes, thanks Mimo! I don't think anyone can wait! WOW. 24/7? Wait... this isn't math! NOO!!! Hey! I went to Florida too!! You already said that THREE TIMES! Great theory! I don't think anyone else has said that! Great idea! Then there would be nobody to stop him! I think the "SA" one is part of "PSA"
too bad i don't have a DS. Well you can get one D.S. at Target. Then, the box is only 6.99(I think). another theroy of mine is that he is going to take over cp(thats why the statue is there)and then he is trrying to look for the underwater room because theres pirate treasure there! I HAVE A VERY GOOD THEROY!maybe herbert is trying to find places in the ocean where sealions live then take over them with his statue which has mind control powers and use the sea lions to attack the penguins+puffles! u wanted a weird one then here it is . herbert found out about cpg and now is trying to kidnap mimo's and ohter mod's [enguins because we r trying 2 find about what he is ty\rying 2 do!! !